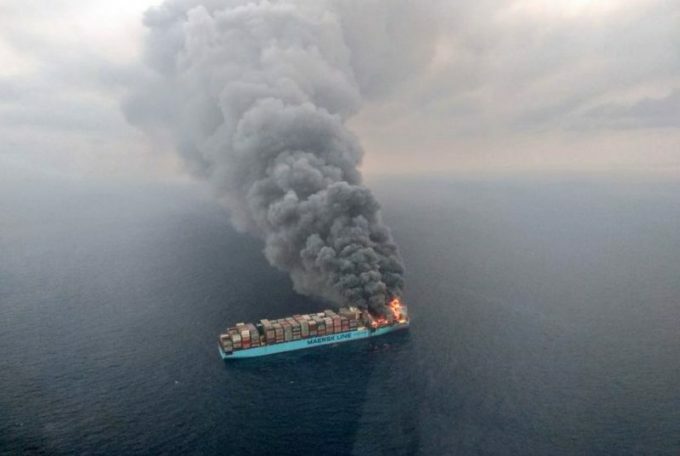 Shippers with cargo aboard the fire-stricken Maersk Honam will have to stump up over half its value if it is to be released under general average arrangements. MSC, Maersk Line’s 2M partner, confirmed this morning that the vessel is due to finally dock at Dubai on 22 May, with discharging likely to take between four days and a week. This week, vessel salvor Richard Hogg Lindley (RHL) fixed the salvage security at 42.5% of the cargo value, as well as requiring a further 11.5% as a general average deposit. This means a shipper with goods worth $100,000 in a container faces a combined general average and salvage security bond bill of $54,000 to have the cargo released. MSC said this week: “The submission of the GA and salvage securities is a prerequisite for the cargo to be released from Jebel Ali. “Following completion of the discharging operations, the containers identified as potentially damaged will undergo an inspection at Jebel Ali and relevant customers will be invited to be represented at a joint inspection. Alex Kemp, partner at global law firm HFW, explained: General average is a tool for sharing the losses arising from a marine casualty between all the parties involved in that casualty. The vessel owners, bunker owners, container shell owners and cargo owners will all contribute their share to the losses incurred. “In order to ensure that everyone pays their fair share, the vessel owner usually has the power to detain the cargo pending the provision of security. If security is not provided, it is often open to the vessel owner to sell the cargo in order to raise the funds to pay the contribution due from that particular cargo owner,” he said. However, in a further twist today, MSC that it would also look to pass on part of the extra transport and port costs incurred in Dubai to shippers with undamaged cargo. “In consideration of the important geographical deviation provoked by the salvage operations and of the consecutive extra handling/storage costs that will accrue at port of refuge, MSC will unfortunately not be in position to carry your cargo to destination without collecting additional charges. For shippers that do not want to pay the extra charge, MSC said their containers would be “handed back to your local representatives under the double prerequisite that the original bills of lading have been returned to us duly endorsed and that your shipment has been released from general average/salvage, and will be subject to payment of storage and demurrage as per our tariff”. Customers have until the close of business on 24 May to relay their decision to the carrier.